Almost three months after elections in Italy, a new Prime Minister - Giuseppe Conte - has been sworn in, ending political deadlock and months of uncertainty for the country. Conte will now lead a populist government with ministers drawn from both the anti-establishment Five Star Movement (M5S) and the right-wing League. Sputnik discussed this with Daniela Giannetti, a professor from the Department of Political and Social Sciences of the University of Bologna. Sputnik: It's a difficult situation in Italy, isn't it? 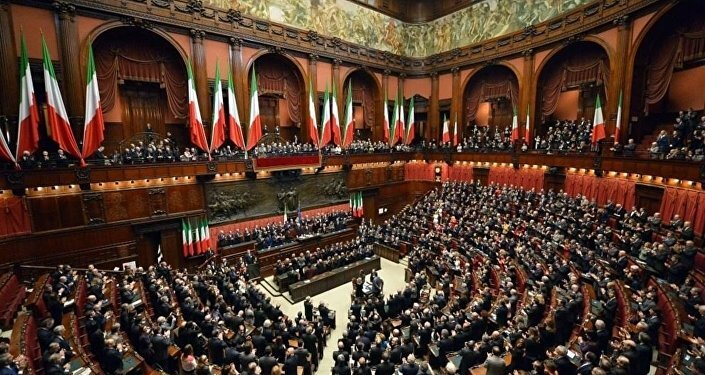 The country is in a very long, protracted crisis; what are the main disagreements over the formation of the government in Italy? Daniela Giannetti: I agree with you; it is an incredibly protracted political and constitutional crisis, a truly exceptional situation in my opinion, because the two anti-establishment parties were trying in the past days to form a government. For the first time in the history of the Republic, we have a situation like that. It's not only related to the duration of the process of government formation […] now we are close to 90 days of negotiations, we're like the Netherlands, and also the government that was formed by Angela Merkel, the process of government formation lasted six months, but here the situation is different because the parties are not the traditional, mainstream parties, but the parties that were successful in the elections of March 4, they are anti-establishment parties, they have a very different electoral platform. So the question about the main disagreements about government formation has to do with the fact that the two parties are very distant, for example, they have very different internal social policies but they are close on the second important issue (conflict) that was significant during the electoral campaign which is the relation with the euro, so this has become very apparent after the election and during these long negotiations. The issue is to stay or not to stay in Europe, so I think they spent weeks trying to find out elements of agreement in their different political platforms and what they have produced, something that they call a 'contract' something like a government platform. In the end basically they announced how they can reconcile their differences. For example, the Five Star Movement says ok to the basic income, and the Northern League says ok to the flatter tax. These two economic measures are incompatible in terms of their cost, so I think this explains why in the end they are not really willing to govern Italy, in my opinion. Daniela Giannetti: That's exactly the point and this is also the explanation about this different crisis, because Italy is well known for its political crises, but here it's something new in my opinion, they don't play following the rules. We are a parliamentary democracy, we have a President of the Republic that according to Article 90 of the Constitution, has a duty to sign on the proposed minister from the prospective five ministers, but everything has been done in a different way from the past. They first negotiated the program, the government program, and then they indicated a Prime Minister, somebody that did not come out of the blue, this professor Conte. But President Mattarella, the head of state, was rather patient because he allowed them to spend all this time and then, in the end, when they wanted to stick to the name of the Minister for the economy Mattarella had this reaction, but it is true that all the crisis was managed in a way that was utterly different from the past. We still are in a parliamentary Republic, so these people in my opinion they seem not to know what are the rules, democracy is not just this so-called will of the people, democracy is also about cheques and balances, so in Italy the head of state plays an important role, and he has played this role also in the past but at the moment, in my opinion, he's trying to save the situation that's very problematic and very dangerous for some reason. For more information listen to this edition of Weekend Special with Daniela Giannetti.